NPR's All Things Considered devoted an entire one-sided story Tuesday night to the apparently heart-breaking news that illegal aliens are considering moving out of Arizona to more illegal-friendly states. Reporter Ted Robbins spent his whole story talking to illegal aliens and their defenders about how they're misunderstood, and even touted how community organizers are "flexing their political muscle" by putting together "barrio defense committees" like "reverse neighborhood watches" to alert illegals that law enforcement is in the area. The Pew Research Center last year found that public trust in the media was at an historic low because of those perceived slants. Well, several listeners thought our story had a bit of a slant. Stan Henney of Longmont, Colorado, writes: The reporter described Fox News as voraciously conservative, and MSNBC as tilting to the left. Both are subjective, not objective descriptions. I personally think that while some Fox personalities can be aggressive, MSNBC does a lot more than just tilt. In many ways, David Remnick's new book, "The Bridge: The Life and Rise of Barack Obama," is very much like its subject: even-handed, eloquent, beautifully packaged. In Friday's speech at George Mason University, President Obama slammed as one of the "crazy things" conservatives said about his health-care effort was that it would offer federal insurance coverage to illegal aliens. On Friday night's All Things Considered newscast on National Public Radio, reporter David Welna's story underlined that liberals like Rep. Luis Gutierrez expected exactly that, but are now hoping that an amnesty bill will make them eligible instead. 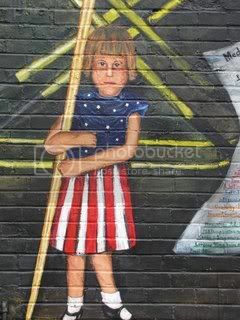 But Welna sought out no opponents of illegal immigration for comment. The renewed effort to move immigration legislation comes as thousands of pro-immigrant activists plan to march on the Capitol this Sunday as the final showdown on health care begins in the House. As Brian Williams hailed Patrick Kennedy’s "gripping" attack on the media for ignoring yesterday’s House debate on Afghanistan, perhaps Kennedy should be offering an apology to his fellow liberals at National Public Radio. On Wednesday’s night’s All Things Considered, NPR reporter Andrea Seabrook hailed the debate, and even though Kennedy’s "anti-war" side lost by almost 6 to 1 (356 to 65), NPR’s soundbite count was far different: three for "peace," two for "war." The most striking thing about the debate today was that the House was having it at all. This is the first time since Congress voted to authorize the war in 2001 that there's been a clear debate about the policy. In previous debates, the war policy was always connected to its funding. So, if lawmakers didn't support the war, they would have to vote against a bill that included support for the troops. That's a tough position for an elected official whose charge, in part, is to deploy the armed forces responsibly. Robert Siegel, an anchor of NPR’s evening newscast All Things Considered, had an emotional response on Wednesday night as Pew pollster Andrew Kohut described how young adults voted heavily for Obama and call themselves liberals, are less "militaristic" and less religious: "Who raised these terrific kids, Andy?" The men laughed. SIEGEL: Give us a thumbnail sketch of the millennials. KOHUT: They're Democratic. They voted very heavily for Barack Obama. They're a little less supportive of Obama today, but still - compared to other generations - they are more supportive of the Democratic Party. They're more supportive of Barack Obama. National Public Radio covered the "Code Red" protests against liberal health "reform" plans on Tuesday night’s All Things Considered newscast, but the tone wasn’t loaded with respect. Last week, NPR president Vivian Schiller took questions briefly on washingtonpost.com about the taxpayer-funded radio network. When the liberal-bias question came up, she claimed "NPR tilts left! NPR tilts right! Frankly, we hear it equally from both sides -- or should I say from ALL since most issues are not that linear. The fact is, NPR takes NO sides." 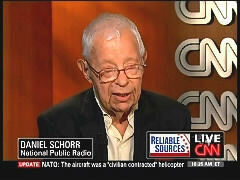 When someone discussed the regular commentaries of NPR Senior News Analyst Daniel Schorr, she claimed: "Dan Schor [sic] is a liberal commentator. I will not deny that is true. So what do we do about that? We balance his views with those of conservative guest commentators who frequently appear on our airwaves." But what if those conservative guests just happen to take a stand NPR likes? Case in point: on Tuesday night’s All Things Considered, NPR touted a Sarah Palin book review by "conservative columnist" Rod Dreher, who concluded: "She quotes her father's line upon her resignation this summer as Alaska's governor: Sarah's not retreating, she's reloading. 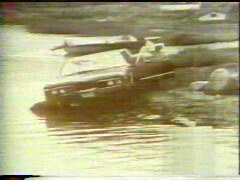 On evidence of this book, Sarah Palin is charging toward 2012 shooting blanks." Speaking of blanks, did Dreher really read the whole book? On his Beliefnet blog yesterday, Dreher blogged at 12:35 pm that he was 100 pages in. All Things Considered starts airing locally at 4 pm. Did he really finish the book and write a script before the taping? NPR's Schorr: ObamaCare Would 'Save Many Lives,' So Why Fuss Over Illegal Aliens? Barring illegal from insurance benefits doesn't bar them from receiving treatment in a hospital emergency room. ERs have become the place of treatment of last resort for too many people here legally or illegally. T.R. Reid tells of a dramatic case in his book "The Healing of America." Nikki White lost her job and health insurance as a result of having a type of lupus. Because of her pre-existing condition, she couldn't get new health insurance. Eventually, she collapsed and was taken to the emergency room. Three doctors undertook to treat her until her condition stabilized. That involved six months in critical care and 25 surgical operations. Then she went home, still without insurance, and died at the age of 32. Her doctor, Amylyn Crawford, said: Nikki died of complications of the failing American health care system. National Public Radio ombudsman Alicia Shepard isn’t afraid to raise questions of liberal bias occasionally.